I promised Jeff that I would post a picture every single day this summer, and I already missed yesterday -- Spectacular Saturday (These days of the week labels are beginning to remind me of a pack of little kid's underwear.)! I do have an excuse though. I am sick. Yesterday I came down with some sort of rogenbogen, as my mom would say. I tried to google this word, but, curiously, nothing turned up! Regardless, I feel bad, and I think Jeff will understand. 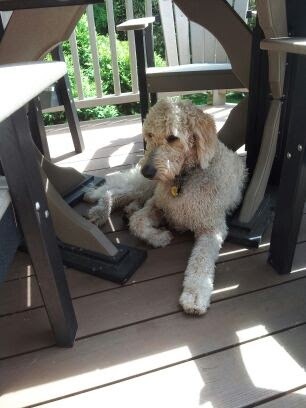 When it gets too hot on the deck, this is where the Milt Dog likes to sit -- under the table in his little cave. After another runaway incident at the lake yesterday, Milton has been spending more and more of his time in close vicinity under his Momma's eye. I think Jeff is beginning to regret that he let me take our goldendoodle for the summer. Discipline is not my strong suit, and this guy's been a little hellion on four-legs since he got here!